The colored prototype of Nendoroid Tsukuyomi Sasami from the anime series Sasami-san@Ganbaranai becomes official today as she is available for pre-order and got the preview treatment by Mikatan. From the anime series ‘Sasami-san@Ganbaranai’ comes a Nendoroid of the shut-in main character, Sasami Tsukuyomi! She comes with three different expressions including a gentle smile, a panicky embarrassed face and a sleepy expression! The tassel of her nightcap is fitted with a joint for some extra posing options, and the nightcap can also be completely removed! She even comes with an attachable strand of sticking-up hair to complete her cute curly-haired look when not wearing the hat! Special parts are also included to display her sitting with her laptop on her knees! Other optional parts such as headphones and her ‘Brother Surveillance Tool’ are also included, allowing you to recreate a number of scenes from the series! Be sure to take great care of Sasami-san, just as her brother would! 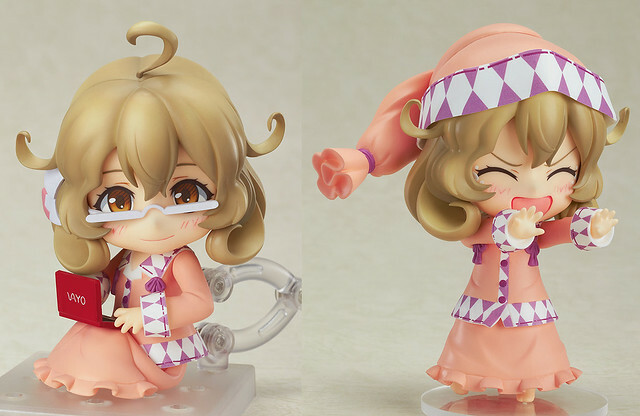 Three nice expressions, a removable night cap, headphones, and the so-called “Brother Surveillance Tool” are the main features of this Nendoroid, aside from her unique outfit – pajamas! She will be released on August, bearing 3800 Yen price tag. Are you going to get her as well, Nendonesian? This entry was posted in News and tagged nendoroid, sasami-san ganbaranai, tsukuyomi sasami. ← Surprise: Nendoroid Sakura Mikudayo is Announced!